1.1 Square Root of a any number by the long division method. 1.2 Square Root of a Perfect Square by using the Prime Factorization Method. 1.3 Short cut trick for find the square root for perfect square number. 1.4 Approximate Square Root of any number which is not a Perfect square. 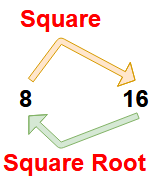 Square Root of a any number by the long division method. 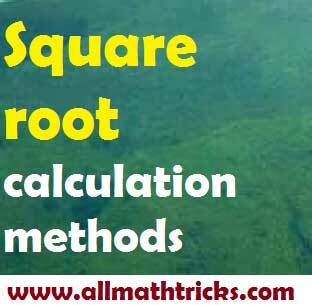 (It is general method for square root calculation). Square Root of a Perfect Square by using the Prime Factorization Method. Short cut trick for find the square root for perfect square number. Approximate Square Root of any number which is not a Perfect square. 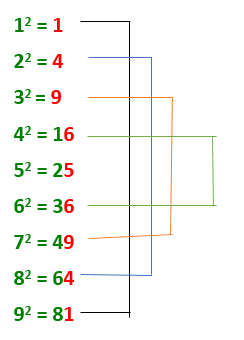 Square Root of a any number by the long division method. Here explain with example in step by step. 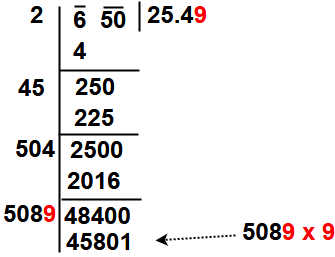 Take a example Find √650 to one decimal place. Step 1 : The given number to be group the digits in pairs, and the remaining digit (if any) is called a period. Step 2 : Find the largest number whose square is equal to or just less than the first period or pair. Here Square the 2, giving 4, and Square the 3, giving 9. So write 4 that underneath the 6. Take the number ‘ 2 ” as the divisor and also as the quotient. Step 3 : Now take Subtract the product of the divisor and the quotient (i.e 2 x 2 = 4) from the first period or pair ( i.e 4). Bring down the next pair of digits and this becomes the new dividend. Step 4: Now, the new divisor is obtained by taking two times the quotient. 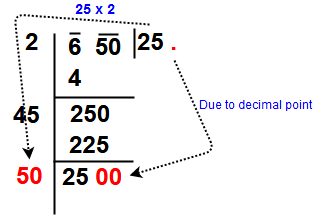 Here quotient is 2 so new divisor 2 x 2 = 4 and the new dividend is 250. Step 5: Now think suitable single digit number which is also taken as the next digit of the quotient. The single digit is to be choose like the product of that product of the new divisor and the this single digit to be equal to or just less than the new dividend. Here check one by one digit i.e 41 x 1 = 41 , 42 x 2 = 84, 43 x 3 = 129, 44 x 4 = 176, 45 x 5 = 225, 46 x 6 = 275 . So take the single digit is 5. Step 6 : Subtract and bring down the next pair of digits to dividend. 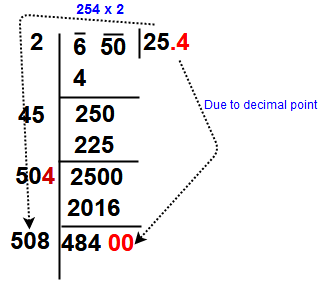 So here not having the pairs so put the decimal in quotient place and drop down digits 00. The new divisor is obtained by taking two times the quotient. 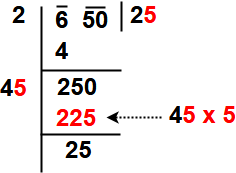 Here quotient is 25 so new divisor 2 x 25= 50 and the new dividend is 2500. Now Repeat steps (4), (5)and (6) till all the periods have been taken up. Finally the quotient so obtained is the required square root of the given number. So our final answer is √650 = 25.49 = 25.5. Step1 : Write given number into prime factors. Step2 : Make pairs of similar factors. Step 3 : Take the product of prime factors, then choosing one factor out of each pair. Example : Find the Square root of 576 by prime factorization method. Remember the following table ( i,e squares of 1 to 9 numbers) and given simple logic. If last digit of perfect Square number =1, last digit of Square root for that number=1 or 9. If last digit of perfect Square number =4 , last digit of Square root for that number=2 or 8. If last digit of perfect Square number =9, last digit of Square root for that number=3 or 7. If last digit of perfect Square number =6, last digit of Square root for that number=4 or 6. If last digit of perfect Square number =5, last digit of Square root for that number=5. Ex. 1: Find the square root of 7056. Step 1 : The given number to be group the digits in pairs, and the remaining digit (if any) is called a period. Write two digit parts i.e 70 – 56 and Lost digit is ” 6 ” so last digit of Square root for that number=4 or 6. Step 2 : Leave the first two digits and take the next remaining digits. Here remaining number is ” 70″. Step 3 : Find the less square number for ” 70″ . Step 4 : Square root of 7056 is 84 or 86. Step 5 : Take the second digit in square root (i.e 8 ) and multiplying it, by next preceding number (i.e 8 x 9 = 72 ). Step 6 : Compare the multiplied value ( i.e 72) with the 2nd part of the number (i.e 70 ). If the 2nd part of the number is high then take big number. If the 2nd part of the number is less then take small number. Here ( 2nd part of the number) 70 < 72 . So take small number 84 from 84 and 86. Square root of 7056 is 86. Step 1 : Separate the number into two digits (i. e 7 – 84) and Identify the lost digit of the number. Here lost digit is ” 4″ so last digit of Square root for that number=2 or 8. Step 2 : Leave the first two digits and take the next remaining digits. Here remaining the number is ” 7″. Step 3 : Find the less square number for ” 7″ . Step 4 : Square root of 784 is 22 or 28. Step 5 : Take the second digit in square root (i.e 2 ) and multiply it by next preceding number (i.e 2 x 3 = 6 ). Here 7 > 6 . So take height number 28 from 22 and 28. Square root of 784 is 28. Find the Square Root of 650. Find the Square Root of 1009. =32 – 0.23 = 31.77 (approximate value). Quite an eye opener. Square root calculations are amazing. Thank you.